The night was dark and stormy. Yeah, I know you’ve heard that one before. But that’s how it was when I arrived in Stanthorpe on the Friday night. After very low temperatures all through the week I’m sure a lot of people were concerned about rain affecting our weekend of racing. 10 minutes after I arrived it started to rain. Luckily Bobby Glock and Teddy Heys had already pitched a tent and built a fire. Those sidecar guys know how to rough it. After an early night, well, for some, the next morning was a complete surprise. The day dawned bright and clear with the promise of full sunlight to both dry everything out and to get some heat into the track. After warming ourselves by the fire and a couple of cups of coffee, we leisurely began making preparations for the day. Final work on the bikes, like engine timing and the ritual “taping of the master cylinder”, and scrutineering. The two day format seems to work really well. Plenty of time in the morning for people to get to the track, do their paperwork and go through scrutineering. And then plenty of time on the Sunday afternoon for people to pack up and head for home. Practice itself went without a hitch. And this set the tone for the rest of the weekend. Apart from a couple of very minor weeds excursions and the odd hole in the crankcases the weekend was virtually incident free. From memory we paid the Ambulance guys to have a lazy weekend. We like it like that. Despite the full sunshine I don’t think the track temperature ever got warm enough to let anybody’s tyres work properly. 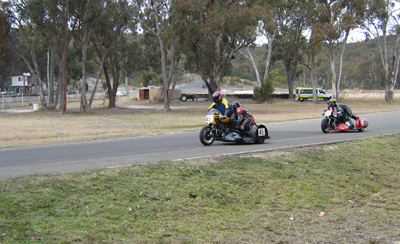 Certainly, the sidecar guys were sideways guys most of the time. As is often the case these days I get so engrossed in the pits that I miss the best part of the action on the track. I know that I did see Bert Skuce way out in front a couple of times. I tried hard to catch a couple of laps of John Downs on Chris Perry’s big Bultaco (compared to the 125 he was riding) and was wondering if he would be able to give Russell Bently a fright. By the end of the weekend I think everybody was happy. 7 races has to be fairly good value for money. Keeping the races short gives everybody a chance to make good on missed starts (well, the get another race to try it again) and reduces the problems associated with lapping slower riders. And as some of us get older it means we can go hard for the entire race, not just the first 5 laps. Unfortunately, I didn’t get a single picture of any of this weekend. If anyone has some happy snaps I’d love to showcase something from the weekend on our homepage. My condolences to anyone who couldn’t get to this meeting. You missed a really, really great weekend.